Let Them Eat Cake Giveaway! Do you have a sweet tooth? Well this is an event you don’t want to miss. I am super excited to be a guest judge this year. This is your chance to win 2 free tickets to the event. 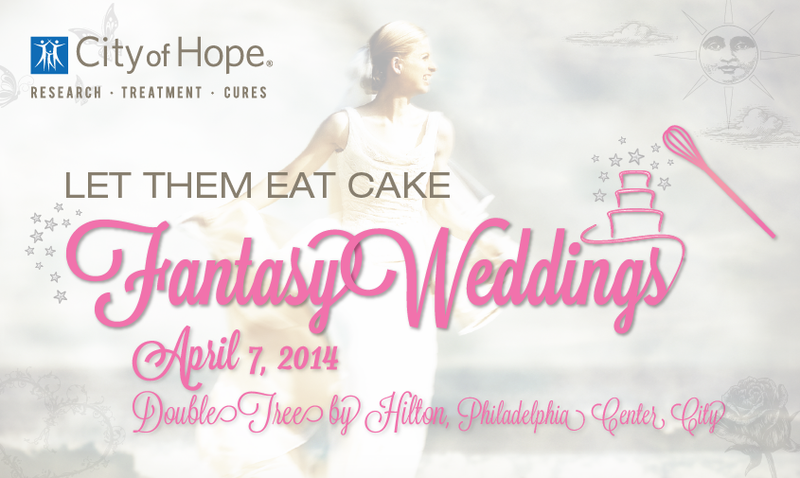 City of Hope Philadelphia celebrates ten years of fondant fun with Let Them Eat Cake: Fantasy Weddings on Monday, April 7, 2014 at 6:00pm at the DoubleTree Hilton (237 Broad Street, Philadelphia, PA). Brides-to-be, dessert fanatics and fondant foodies will sample creations from 40 professional pastry chefs and student bakers from around the tri-state region. Guests will enjoy a new Sweetheart Tablescape competition, Korbel champagne, live music from BVT Live, and the opportunity to meet celebrity chefs Marc and Benny (City Cakes NY) and John Moeller (former White House chef). Tickets can be purchased at bit.ly/cohcake14 or by calling 215-985-0869. All proceeds benefit City of Hope to help cut out cancer, HIV/AIDS and other life-threatening illnesses. Whether you are a bride or groom, or simply have a huge sweet tooth, this is the perfect opportunity to sample 40 scrumptious cakes from the most talented bakers in the tri-state area. Early confirmed participants include Classic Cakes, Granny Schmidt’s, Wonderland Cakes, The Restaurant School of Walnut Hill and The Art Institute of Philadelphia. Each Fantasy Weddings masterpiece will be judged by celebrity judges, wedding experts and local VIPs in two levels (professional and college) in six categories (Most Artistic, Best Tasting, Best Theme, Best of Show, more). Guests can also vote in the “People’s Choice” category. In addition to the main cake competition, City of Hope announces a new Sweetheart Tablescape competition sponsored by UBER and coordinated by Soiree Philadelphia. Local wedding planning and design companies will create Fantasy Wedding Tablescape that will be judged by guests. All new UBER users will receive a complimentary ride up to $20.00 using promo code Cityofhope2014. For every new user who rides with this code, UBER will donate $5.00 to City of Hope. Registration is open for professional bakers and pastry chefs, as well as Tablescape competitors. All interested parties should contact Amy Tieman at City of Hope at 215-985-0869 and atieman@coh.org. So here is what you have to do for this giveaway is leave a comment at one or more of the following Homemade Delish social pages, or this site. Good luck everyone. 1. Join Homemade Delish and City of Hope on Facebook. Leave a separate comment letting us know you did so. 2. Follow @homemadedelish and @CityofHopePhila on Twitter. Leave a separate comment letting us know you are following if you havent already. 3. Subscribe to Homemade Delish via email. Leave a separate comment letting us know you subscribe via email. If you haven’t already. The giveaway is open until Thursday March 27th , at 11:59 p.m. Eastern time. The giveaway is only open to USA residents. Be sure a valid email address is included with your comment(s). Winner will be chosen randomly and announced on this post. We will email the winner and if the winner doesn’t respond in 24 hours, a new winner will be chosen. Product will be shipped by Homemade Delish. Good luck!